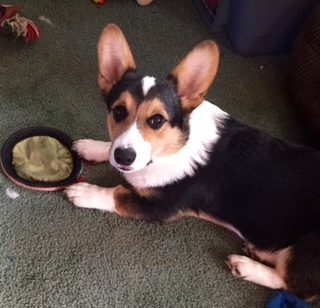 Have questions about our Corgis? We take pride in the quality of our Corgis. They have wonderful personalities, each are very different. We live on a farm and our Corgis enjoy the outdoors. This is Ruby, she is an Australian Shepherd and is our family member. She loves the Corgis and the Cows. Part of our crew, waiting for Dad to go to work. Caspian on the left and Bella on the right. Shay D. Thank you Shay!! If Corgis seem like magical dogs to you, you may not be surprised to learn that in Welsh folklore, they actually are magical. Legend has it that Corgis served as mounts for fairy warriors patrolling the forests of Wales. The pattern of a Corgi's coat is supposed to show the outline of the saddles and harnesses the fairies used to ride their Corgi steeds.